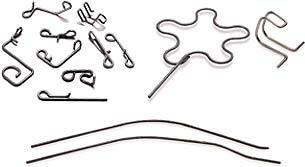 Our state-of-the-art CNC wire forming machines are used in the manufacture of a wide variety of wireformed products. Using laser controlled sensoring, we can produce a superior, consistent and controlled product. Our in-house engineering will assist in the design of customer requirements, reducing set-up charges and lead times. Our CNC machines have the ability to manufacture complex parts in one complete process further reducing costs. The CNC wire forming machines have the capability of handling diameters from .080” to .3125”. Customers may specify any one of a number of special coatings, plating or paint which can be applied to the wire form during the manufacturing process. Premier Spring is a member of the Spring Manufacturers Institute.